In Red where John was captured, processed as a German POW and the two known camps where he was incarcerated. 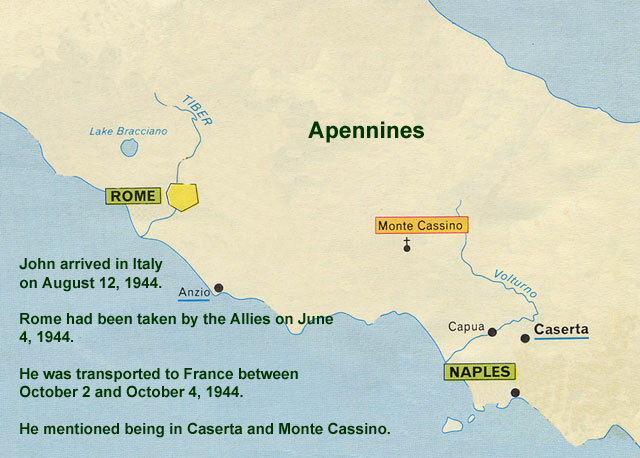 In Light blue the route he took escaping from the camp and making his way to the American lines in May 1945. John was captured November 28, 1944 in Wissenbach France. He was processed as a POW in Limburg am Lahn on December 1, 1944. Subsequently he was moved to Stalag IV B in Muhlberg near Dresden and then to Stalag IV A near Holnstein/Bad Schandau. The war ended in Europe on May 7, 1945 and he and other American POW started making their was towards the American lines at Chemnitz. A 1944 map of Germany which includes the rail lines indicates that John's route from Wissenbourgh, through Limburg and on to Muhlberg (Dresden) and thence to Bad Schandau might have been relatively direct. The trian lines go from Wissenburgh through Worms along the Rhine crossing at Mainz to Limburg. 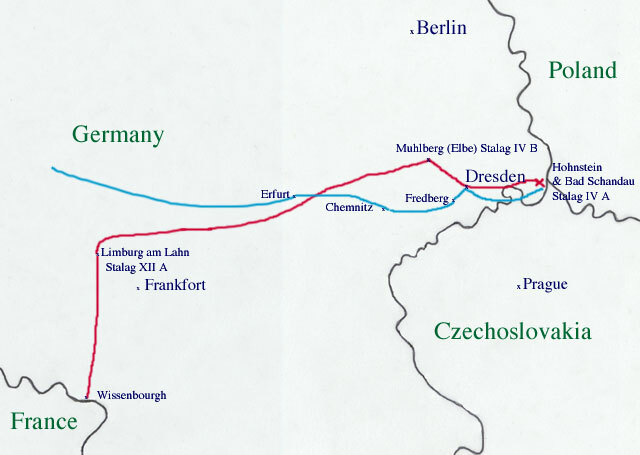 From Limburgh there was a line through Erfert to Liepzig then Dresden and finally Bad Schandau. Note: When I originally made up this map I believed that John was captured near Wissembourg on the French German border — the War Department letter listed Wissembourg as the place he was discovered missing in action. After further study of the battles and campaigns it seemed that Wissembourg was too far north for the campaign and date. I now believe that John was captured in "Wisembach" in the Vosges mountains between Colmar and Strasbourg. "Wisembach" is mentioned in the campaign that the 179th Infantry took part in in November 1944.